The aptly-named Joy is a modern design which looks amazing, is light and folds up small and flat for easy transport. The built-in lazy kate folds in, the treadle board folds up and the small, light wheel can be carried by its handle or in its own carry bag. Take this wheel with you wherever you go! It comes lacquered and assembled, so is ready to start spinning straight out of the box. It has single drive and four flyer ratios for fine to chunky yarns. Joy comes with a sliding-hook flyer as standard, and new larger bobbins which hold 30% more yarn than the older standard bobbins. For spinning bigger, chunkier yarn (fancy yarn or art yarn) you can now add the Freedom Flyer, a jumbo, sliding-hook flyer for Joy. Note that Joy now only comes complete with the carry bag. 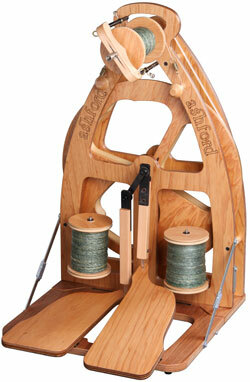 Double treadle with bag : £595 now out of stock what's going on?